The first weekend in April has a wealth of major events to get sports fans salivating. Manchester City’s bid for the quadruple will continue on April 6 after they were handed the first FA Cup semi-final tie. Wolves defender Matt Doherty has admitted he had doubts about whether he could make it in the Premier League. Wolves boss Nuno Espirito Santo believes the FA Cup clash against Manchester United is the club’s biggest game for many years. Liverpool brought the gap between themselves and Premier League leaders Manchester City back down to a point on Sunday with a 4-2 home win against Burnley, a day on from Pep Guardiola’s table-toppers seeing off Watford 3-1. Steve Mounie struck a stoppage-time winner as Huddersfield beat Wolves 1-0 to clinch their first Premier League win in three months. Wolves boss Nuno Espirito Santo insists their defeat to Huddersfield earlier this season will have no bearing on the return fixture. Raul Jimenez says Wolves “have to dream” after they ended a 16-year wait to the reach the FA Cup quarter-finals. Wolves have installed three different safe-standing options at Molineux, making them the first Premier League club to do so at an operational stadium. 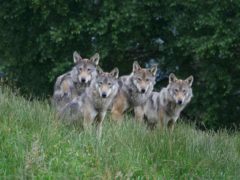 Jurassic Park-style fences could allow wolves to be safely re-introduced to the Scottish Highlands, experts have claimed.